While we’ve all been casting our eyes over the cobbles and debating the paving in King’s Square, this new bar was quietly taking shape, in premises in the square previously occupied by Your Move, estate agents. It can be interesting to look at one commercial property over time as its changes of use often illustrate broader cultural shifts, or perhaps a passing trend. This one illustrates that there will always be a demand for pubs in town. 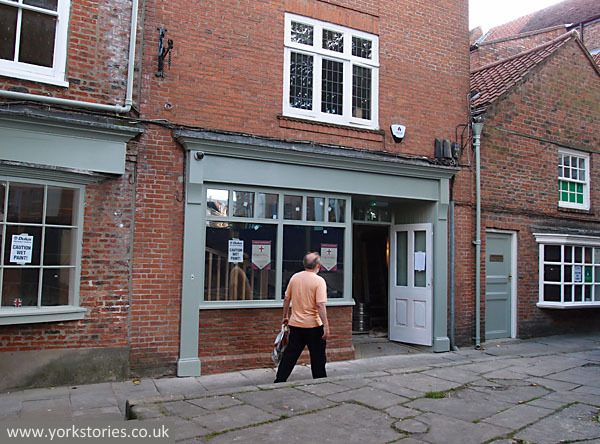 The opening of this bar, last weekend, coincided with the opening of The Hop, not far away, in that building on Fossgate I wrote about a while back. The old Army and Navy Stores on the corner of Fossgate and Pavement is also going to be a bar, apparently, though no sign of construction taking place there yet. So that’s two new bars, with perhaps a third, a few minutes’ walk apart, in two areas undergoing more general change. Fossgate has been transformed in recent years by the arrival of many interesting independent shops, and seems more ‘central’ again, after looking like rather a forgotten street for a while. The changes in King’s Square have been imposed as part of a deliberate plan for ‘improvement’, rather than being a natural and gradual transformation. In Fossgate and King’s Square these new bars will play their part in reinvigorating, adding more life, more nightlife in particular. Not universally welcomed, I sense. There’s a lot of concern over the drinking culture, and the antisocial behaviour often resulting from visiting too many bars in one night, as York sees more and more stag and hen parties descending on the city at weekends. I doubt the King’s Square to Fossgate run will ever get as noisy and messy as the Micklegate run, but it does change a street, certainly for any people living there, if a bar opens up nearby. Particularly since the smoking ban, as all bars tend to have groups of people standing around outside smoking, and talking in THAT RATHER LOUD VOICE people often adopt when they’ve had a few. 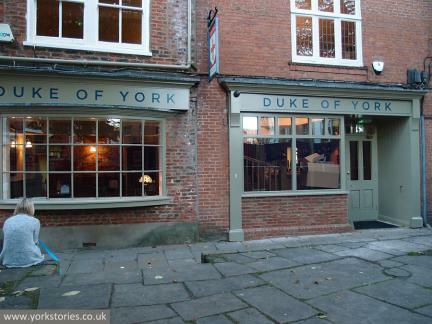 I’ve not been into the Duke of York, and probably won’t, and don’t go to pubs these days much at all. (I don’t like beer, would rather drink wine, and would rather drink it where I can have a cigarette at the same time without having to stand in the street.) I have popped into The Hop, briefly, and very nice it is too. They’ve left much of the old glazed brick visible, complete with chipped bits. A nice authentic original feature, handsomely accompanied by very smart and stylish additions, including colourful tiling on the floor. So, The Hop and the Duke of York, once a cafe and a shop unit, now two more bars. What do we think about this? Looks like there’s demand, and probably the city centre has more shop units than it needs, which is why some stay empty, and other shops disappear after only a short time. It could also be said that these new drinking establishments are replacing those lost elsewhere — many on the outskirts, in the suburbs, have been demolished in recent years. We could see these new city centre bars as their replacements, in a city centre where the demand is. But, like I said, I’m not ‘up town’ in the evenings much these days, so would be interested in what other people think. This is all proper Yorkshire-based endeavour, as The Duke of York is a Leeds Brewery pub, and The Hop an Ossett Brewery pub. 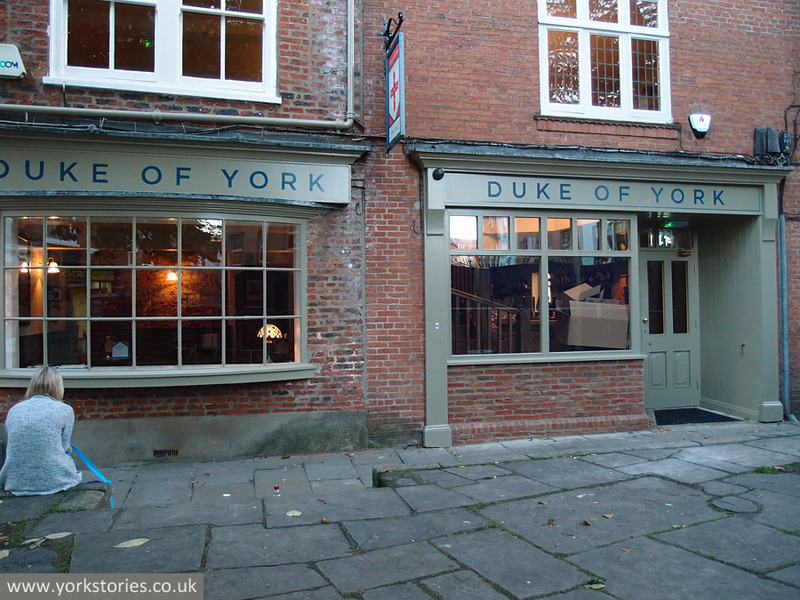 Between them, a stone’s throw from ‘The Duke’, is the well-known Last Drop Inn, from our very own York Brewery. So we might not be ‘manufacturing’ here in Yorkshire like we used to — textiles, steel, railway rolling stock, that kind of thing — but we’re making a lot of beer. For more information on these two new pubs, see Gavin Aitchison’s article in The Press.